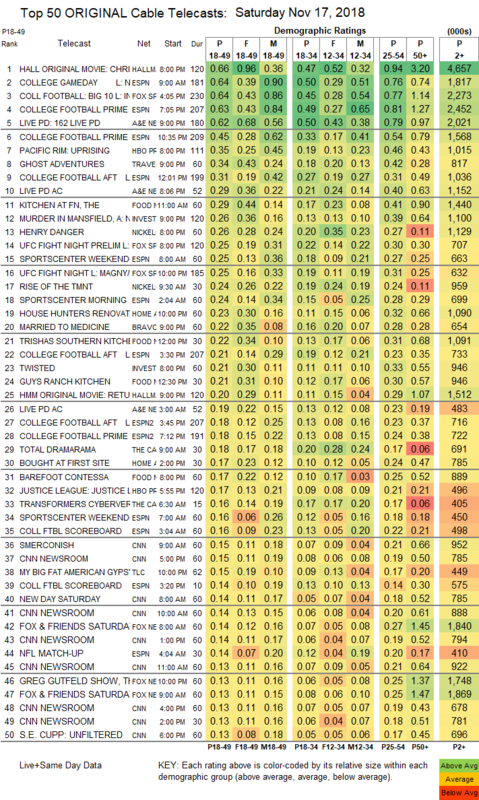 NETWORK FINALS: FOX’s COLLEGE FOOTBALL game adjusted to 0.7. CABLE HIGHLIGHTS: Hallmark’s original movie CHRISTMAS AT GRACELAND led Saturday cable at 0.66. Fox Sports 1’s afternoon COLLEGE FOOTBALL game narrowly beat ESPN’s evening game, 0.64 vs. 0.63, with other ESPN games at 0.45/0.31, and with Fox Sports 1’s UFC FIGHT NIGHT at 0.25/0.25. 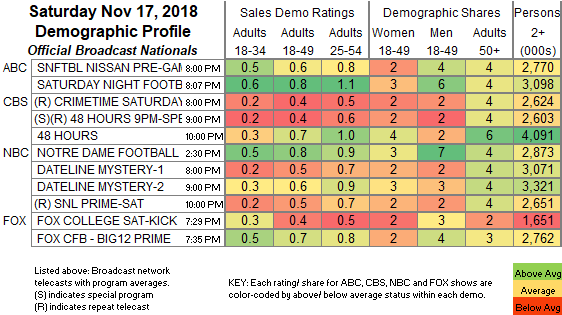 A&E’s LIVE PD ticked down to 0.62, with the lead-in clip show at 0.29. Travel Channel’s GHOST ADVENTURES was steady at 0.34. On Food Network, KITCHEN AT FN edged up 0.02 to 0.29, PIONEER WOMAN lost 0.05 to 0.26, and TRISHA’S SOUTHERN KITCHEN ticked up to 0.22. ID’s MURDER IN MANSFIELD was at 0.26, and TWISTED held at 0.21. Nickelodeon’s evening HENRY DANGER gained 0.03 to 0.26, and its morning RISE OF THE TMNT was down 0.04 to 0.24. HGTV’s HOUSE HUNTERS RENOVATION rose 0.07 to 0.23. Bravo’s MARRIED TO MEDICINE was up 0.02 to 0.22. TLC’s MY BIG FAT AMERICAN GYPSY WEDDING ticked down to 0.15. On OWN, READY TO LOVE was at 0.07, and CHAD LOVES MICHELLE was at 0.05.